Demonstration by Sean Conner, AKA "Whitesmith"
Tonight's demo is by 9 year old Sean Conner the son of Glenn "NTECH" Conner. Sean is as much of a working smith as many. He earned the money to buy his first anvil by selling things he made. Start with about 22 inches of 1/4 inch round rod. 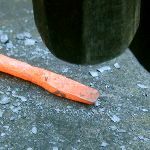 Hammer it down to a sharp point. 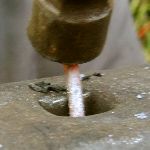 Then make a little circle on the end by bending it over the horn of the anvil. 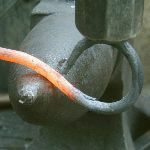 Figure 4 Hit it with a hammer real easy to close the circle up to form a pig tail. You do this on the top of the anvil. Don't hit it too hard or you will flatten the circle. Figure 5 Now put it on the horn again and make a big loop for the handle. Just hit it with the hammer to make the curve. It should bend around and touch when you finish. Figure 6 Heat it up again and put the loop in water to cool just the loop. Put it back on the horn and make it bend the other way (reverse bend). 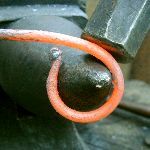 Because the loop is cold you can hit it with a hammer and it will not bend. 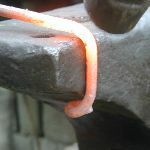 Only the hot metal will bend. Figure 8 Put the handle in water and cool the metal so you can hold it. 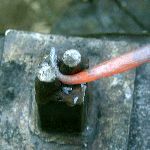 Heat the other end and make a point like a screwdriver. 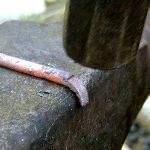 You have to flatten it out, and hammer the sides at the same time, so it does not get too wide. Bend the end over the edge of the anvil. 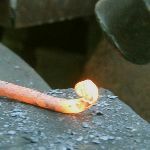 Heat and roll it back tightly untill you can start making a spiral. Figure 11 Keep working on the end till you get a spiral about the size of a dime (about 1/2 inch diameter). 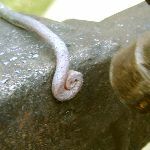 Put it on the edge of the anvil and bend the rod 90 degrees at the edge of the spiral. Figure 12 About 2 inches from the spiral, bend it 90 degrees again. The other way to do this is to use a jig. 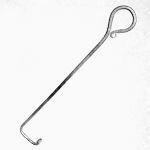 This jig is just two short pieces of 1/4 inch rod welded to the top of a piece of metal. 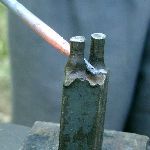 You just put the pointed end of the metal between the two rods and bend the metal in a circle. 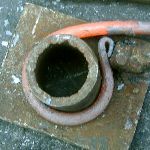 The other jig you need is a piece of pipe with a piece of metal welded next to it to catch (and hold) the end of the rod. 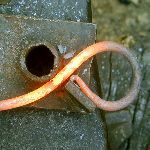 You just catch the loop on the metal and bend the rod around the pipe. Figure 18 You then turn the loop over and bend it in the other direction. Heat the other end and make a point like a screwdriver. 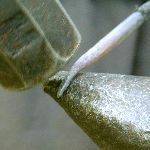 You have to flatten it out and hammer the sides at the same time so it does not get too wide. Bend the end over the edge of the anvil. 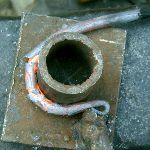 Heat and bend till you can start a spiral. Keep working the end till you get a spiral about the size of a dime (about 1/2 inch diameter). 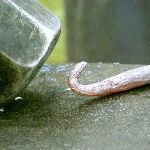 Stick the spiral end 2 inches down into the hardie and hit it with a hammer to make a 90 degree bend. 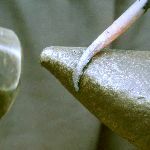 Finish the bend and straighten it around the heel of the anvil. Figure 21 Now you have a colonial pipe lighter. 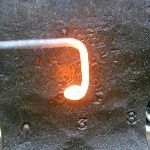 Figure 20 To use it, you just put the spiral end into the fire and get it real hot. 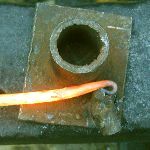 Then put the hot end into the pipe to light it. Would you beeswax this W? Nice work Sean/Glenn. How much do they sell for? That was an excellent Job Sean,,,even better considering you had to put up with your father!! Applause!! Scrolling tongs can be used. I use the horn cause it was faster. Whitesmith --- Thanks for the demo. I wondered how that was used to light a pile, now I know. Thanks. 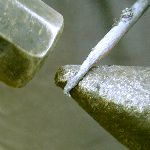 Have you ever tried scrolling tongs? Great Demo Sean Thanks...My son Drake Sez "COOL!" Sean, good work! I'm sure this was the most difficult one you have made since your Dad made you hold still for the pictures! Beeswax would be good for the handle but would burn off when the end was heated to use. Unfinished would be best. 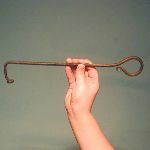 how about making one that would hold a match to light a fireplace with the spiral not closed all the way? Could you leavethe end scroll loose so a paper match could be held to light candles & lamps with the same item? If you want to get fancy, you can hammer the handle square and then put a twist in the square part. Hey, we'll put that in our pipe and smoke it! Yes, you could use it to hold a match. You would need to find "counrty matches", the old time, long wood ones. Just no not make a tight center to the spiral. Leave enough room for the match. Thank you. I sell them for $5.